STEPHENVILLE – The reigning MVP of the Jayhawk West Conference, Rebeka Allen, has committed to continue her softball career with Tarleton State beginning in the 2015 campaign. 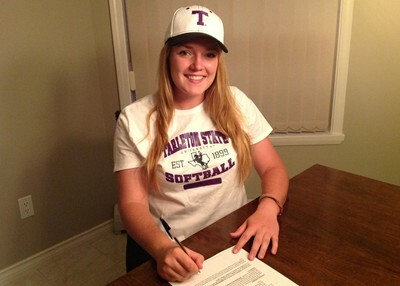 “Becky is such a great addition to our roster,” said Tarleton head coach Julie Mata. “She is consistent and powerful at the plate. She is exactly the kind of player we need to add to our lineup and our infield. Allen is coming off a 2014 season at Seward in which she earned first-team all-region and all-conference honors in addition to being named the conference MVP. She hit .443 in 203 at bats with a .493 on-base percentage, .724 slugging percentage, 68 RBIs, 72 runs scored, 26 doubles and nine home runs. She also had a .978 fielding percentage as a corner infielder for the Saints, who went 47-13 overall and 12-4 in conference play. In her first collegiate season with Seward, Allen was second-team all-region and second-team all-conference while playing five different positions for the Saints. She hit .358 in her freshman campaign with 11 doubles, nine homers and 45 RBIs. Allen, a native of Maple Ridge, British Columbia in Canada, was an honor roll student in all four years of high school at Maple Ridge Secondary School.